Over the last few weeks Janelle and I have been having a think about what we’d really like to achieve in the next 12 months and how that can fit in with things here at LiveKen. As a result we’ve set ourselves and LiveKen targets for 2014/15. We obviously want to make sure LiveKen is a viable (read profitable) business. Increase readership here at LiveKen. It’s a new site so we don’t expect miracles but we do want to bring in new people who are interested in what we have to say. Publish the Foggy Frog and the Pain Gang Picture Book. Raise a minimum $1,500 through donations towards the Foggy Frog Campaign, which I’ll go into in further detail in future posts. $1,500 would allow us to develop a educational workshop for schools about life with an invisible chronic illness. Look at options for adding adverts (looking into Google Adsense) to the site and for joining affiliate programs, such as Amazon Associates. We will be making sure that with each of these options we align with the LiveKen values. For example, through affiliate links we will only recommend products that we have reviewed ourselves and believe will be helpful. On top of this we would like to develop a small support/action group, beginning with our friends, that focuses on simple, sustainable and meaningful living. Shared gardening areas. We have space in our garden to have a veggie patch while Janelle doesn’t, so we will be sharing gardening tasks and produce from the garden. Sharing practical tips for living a simple, sustainable and meaningful life. Homemade cleaning supplies. We’ve started with laundry detergent. 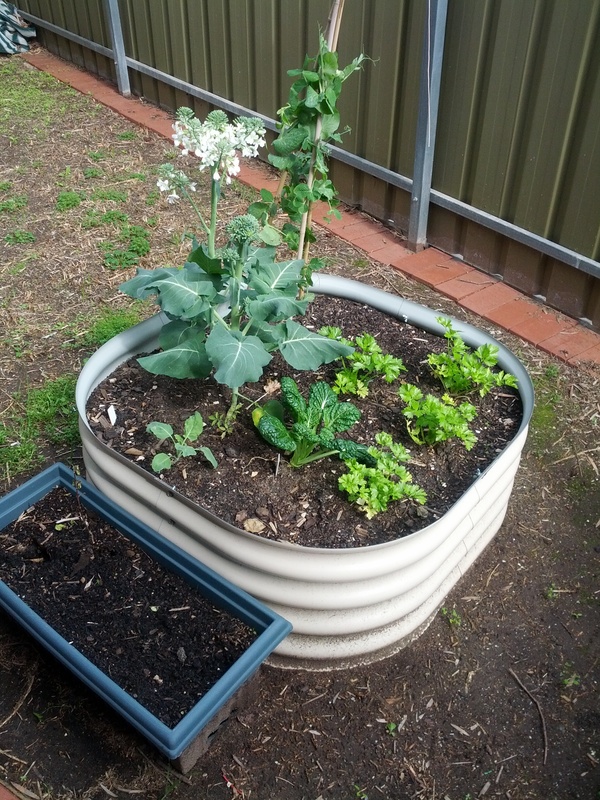 One of two veggie beds already set up in the garden. There is space for more when we feel confident looking after them. In our personal lives, we will be working together to set up budgeting for both of our households and working to declutter and simplify our own lives and houses. We will also be working with our partners to really determine what is meaningful to each of us so that we can work out how to focus our energy there. We will continue to share our journey here on the LiveKen blog in the hope of inspiring others to do the same. Continue to work on finding a balance in life and work towards returning to work. Build up to being able to walk/ride at least 30 minutes a day. Complete my current unit for my University degree (last assignment due next week) and then focus on completing my Certificate IV in Training and Assessment by April 2015. Go on a wonderful holiday with my husband to somewhere we can just relax on the beach for a week or two. So, there you have it. Those are our aspirations and targets for this financial year. Next week we’ll be sharing what we hope you will get out of joining us on this adventure in 2014/15. Until then, use the comment box below to let us know what you think of our goals and targets here at LiveKen. What targets are you aiming for in 2014/15? What would you like to see more of here on LiveKen?